REMINDER: Bow Diddley is a 12 month Block of the Month program beginning February 4, 2017. You have 3 colorways to choose from, Light Blue: 30s fabric, Brown: Kansas Troubles fabric, or Black Flower Colorway fabric. This BOM costs $5/BOM plus shipping. 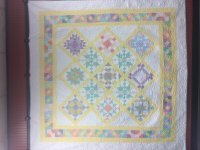 Your finished quilt will measure 92" x 92". Call 620.375.2044 or stop in for more details or to sign up. REMINDER: TODAY IS THE LAST DAY, you can redeem your envelopes. The envelopes must be OPENED IN-STORE and will include a FREE ITEM and a ticket for a DISCOUNT to be used THAT DAY. The Waddington Road Sampler is an 8 month program, starting on February 13th, 2017. 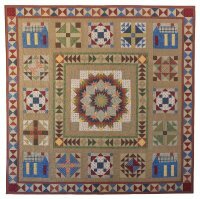 This gorgeous BOM uses the Waddington Road line by Barbara Eikmeier for Paintbrush Studios.The finished quilt measures 90" x 90." This quilt involves machine piecing with basic construction. Suitable for Intermediate Level quilters. Each month you will receive the pattern and fabrics to complete your blocks. The program costs $25.00/month. Call 620.375.2044 or stop in for more details.